Feral Interactive are at it once again, go dust off those thinking caps as they're bringing another game to Linux. As a reminder, Feral Interactive have only recently release Life is Strange: Before the Storm and Total War: Warhammer II is confirmed to be coming this autumn. On top of that, last month they also put up another teaser that we're still guessing. I wouldn't be surprised if they do try to get more ports out earlier now, especially with Steam Play which would eat into their Linux port sales. Anyway…looks like 2018 really will be another great year for Linux gaming! The amount of Linux games Feral has ported now is kind of ridiculous: XCOM, XCOM 2, Tomb Raider, Rise of the Tomb Raider, Mad Max, Shadow of Mordor, HITMAN, F1 2017, Life is Strange, Life is Strange: Before the Storm, Dawn of War II, Dawn of War III, DiRT Rally and the list goes on. What do you think "AURORA" will be? In my dreams, "Working with fire and steel" is Shadow of the Tomb Raider and "Aurora" is Hitman™ 2. Well ,let's narrown down list to SquareEnix , SEGA before jumping into conclusions. Faattori In my dreams, "Working with fire and steel" is Shadow of the Tomb Raider and "Aurora" is Hitman™ 2. I'd take both of those, thank you very much! Otherwise I've no idea. That picture somehow reminds me of Life is Strange but doubt Life is Strange 2 will already be under porting works. Seagulls + Aurora... No clue. Seagulls are maybe for the band A Flock of Seagulls (always a song in the clues)? 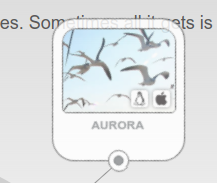 Seagulls and Aurora? Fishing Barent's Sea? riusma Seagulls are maybe for the band A Flock of Seagulls (always a song in the clues)? In their song "I Ran" there is a mention of Aurora (Aurora borealis). There could be a connection.